A NEW electro indie quartet Seatbelts are set to become your new favourite Liverpool band. 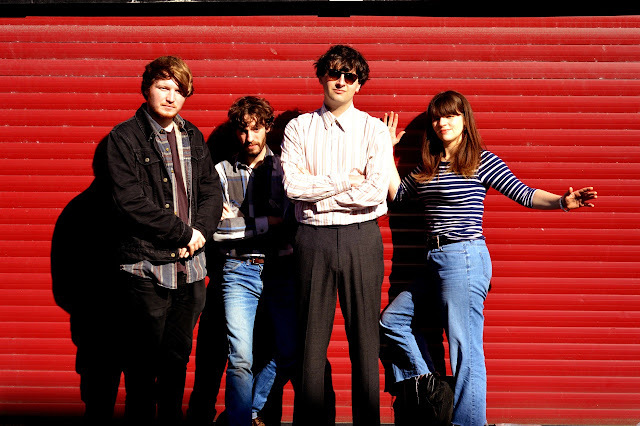 Featuring Hooton Tennis Club's James Madden and Ryan Murphy, Seatbelts is a fun-loving, distorted view of the world we live in. Seatbelts released their debut single 'Hey, Hey Tiger!' taken from their forthcoming EP 'Songs For Vonnegut' on March 30 courtesy of Rooftop Records. Lead by happy-go-lucky, almost spoken word vocals 'Hey, Hey Tiger!' boasts a light bassline which thumps throughout - complimenting the sweet Prince-style guitar and hits of James' mum's chip pan. For fans of Blur, 'Hey, Hey Tiger!' is a snazzy overlap of funk, indie and brit-pop while sending words of warning to their fans about the trials and tribulations of today's society. The smooth addition of keys and the use of a Wah-wah pedal pushes this addictive track into a new realm of Liverpool music. The Music Manual spoke to Ryan and James to find out more about the project. How did Seatbelts all come about? Ryan: James met Abi (Vocals/Keyboards/Guitars) while working at the British Music Experience (BME) on the docks. We met Alex (Drums/Percussion) at Parr Street Studios sometime in 2015. We knew he'd drummed for Bill Ryder-Jones in the past and when mixing the 'Songs For Vonnegut' EP in the studio, we asked him to be our kit-man. The band name came from a conversation James and I had on the phone about what 'The Beatles' would spell backwards. What can people expect from 'Songs For Vonnegut'? James: The songs all have a similar style due to the use of a drum machine, the Alesis SR-18. The music is a bit more quiet and tamed, or crafted. The set of songs comes from a bunch we wrote in a few months late last year. We recently decided to dedicate them to Kurt Vonnegut. This was mainly due to some of the lyrics and concepts being linked to his writings. Ryan: In my bedroom using our trusty Tascam DP-02 and a handful of microphones. James: It was made in a very DIY way. The room feels like our own little innocent world, I suppose. We're able to chip away at a block until something uncovers itself. We tracked and recorded everything ourselves and presented the songs to Parr Street Studios' master mixer, Chris Tambo Taylor. Have you got a lot of material waiting for Seatbelts? Ryan: We've written and recorded a load of new stuff. We influence each other a lot when writing. Swap the stuff we read and watch. We had a lot of songs that didn't make the cut for the EP. It seemed important to polish it down, make it snappy - the best it could be. James: I think we take a lot from music we listen to day-to-day: Neil Young, Jonathan Richman, Talking Heads... It's hard to say directly what our major influences are though. I guess these songs have been a lot less influenced by other artists than the songs we have made in the past. I feel like we've uncovered something new on these songs - we're always trying to push it forward. Is this project a 'new dawn' for you guys? Ryan: We don't really think of it as a 'new dawn' - it's just more stuff we've made under a new name. Myself and James have wrote and recorded/documented stuff together for more than ten years now. We're not going to stop anytime soon... Every day is a new dawn. How different is Seatbelts to Hooton Tennis Club? James: Maybe one difference is the approach. Seatbelts isn't aiming at being a band in the conventional sense. The project isn't interested in being the cool new band in town, playing the club circuits and trying to 'make it'. For me, I want Seatbelts to be open to growth and longevity - to create a sustainable project. I want it to inspire us and nurture us as friends and people as well as being a band. Is Liverpool the land of opportunities for music? Ryan: Well... If you look for it, you will find it. There are a load of great things going on, loads of good music mags and venues and stuff. SO MANY FESTIVALS. There's a great music scene, loads of bands popping up all the time, but being into that obviously we see it. I'm sure the same thing is going on in Manchester, Leeds, Bristol, Brighton, et al. London, definitely. Liverpool has something special though, gotta love living here! Where is the best venue in the city? Ryan: 81 Renshaw Street is a boss little venue. It's been renovated recently and it looks class. They've had a record shop in there for a while now with loads of local stuff in the racks. They do a good full English and the live space in the back is in the Goldilocks zone in terms of size. Go check out a show there, you'll love it. If Seatbelts was a cocktail, what would you be and why? Ryan: We're putting out another song called 'A World Drained Of Wonder' sometime in April, taken from the 'Song For Vonnegut' EP, which we aim to release in May. We've just bought a rubber tiger mask for a video we're currently working on. We're also trying to pinch a bit of spare time to work on the live set, too. The project is in its early stages and it's exciting to be making music. Seatbelts will be supporting Sugar Candy Mountain at The Shipping Forecast on April 14. You can also catch them at 24 Kitchen Street on May 6 for Sound City or supporting Alessis Ark at 81 Renshaw Street on May 18.